This is a mailed coupon from Websaver.ca which you can find in Nivea’s hidden portals. Visit WebSaver.ca, click on the Nivea portal at the bottom and you will see this Nivea coupon. Visit here to find Websaver.ca Nivea’s hidden coupons. You will receive this coupon in the mail within 1-2 weeks. All coupons are free and mailed for free. 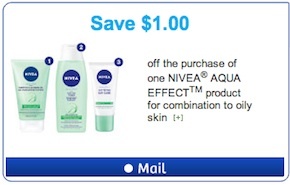 This is a coupon to Save $1 off the purchase of one NIVEA® AQUA EFFECTTM product for combination to oily skin. 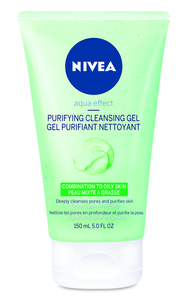 Nivea Aqua effect purifying cleansing gel deeply cleanses pores with purifying peeling scrubs to remove oil and prevent the buildup of impurities, reduces excess sebum to prevent shine while respecting the skin’s natural moisture balance and leaves skin looking healthy and beautiful.